Update: After writing this post, I contacted the management of Ashford Castle outlining what had happened. I swiftly received a considerate, personal and detailed response – everything the preceding communication was not – and I appreciate and accept that what happened was an anomaly due to staffing issues, which was immediately and effectively addressed. 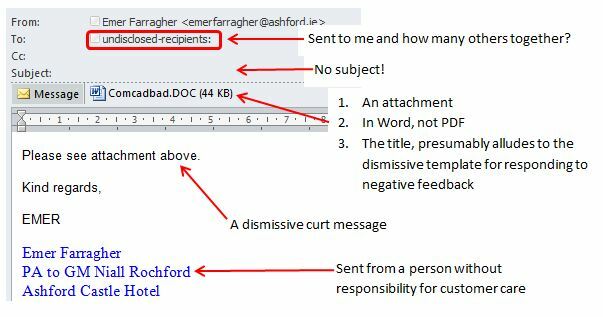 What I had previously presented as “A lesson in shoddy guest relationship management by Ashford Castle” must now, in fairness, be presented as what can go wrong if there is a breakdown in communication with new or temporary personnel. I recently had the good fortune to dine and stay at the unique and beautiful Ashford Castle Hotel. The service all around was terrible, but this was nothing compared to the communication I received from them today. During my 24-hour stay in Ashford Castle I found the food and bar service very poor – dirty dishes were stacked beside our dining table for over 30 minutes, the food was served ages before the wine in the restaurant… unacceptable service anywhere, but particularly difficult to take at over €530 for one night. However, although we were clearly annoyed – we eventually had to ask the Maitre D’ to remove the festering plates – we were not asked if everything was OK. Likewise on checkout, where I submitted the completed customer feedback card outlining our experience. I fumed out of the place resolving to express my pent up frustrations instead on Tripadvisor, Twitter et al. In the end, loyalty to the Irish tourism sector prevented me from doing so (until now). I consider the person who was instructed to send this email entirely blameless; this is a management and process issue. (b) Entitled “COMCADBAD“. I kid you not. During and after my stay in Ashford Castle I was somewhat annoyed at the poor service, given the astronomical cost of what for me was a once-in-a-lifetime experience. It was still very enjoyable, of course – it is privilege to walk the grounds, never mind dine and stay there, so as a supporter of Irish tourism, a loyal Mayo person and a generally peaceful soul, I did not rant on social media as I had planned. Today’s outrageous response has got me back on my soapbox; if nothing else, I hope the “how not to” checklist is useful. What an insincere, bland, conveyor-belt response, it seems the GM hasn’t heard ‘complaints are a golden opportunity’ ..he signed that letter lets not forget. It shows disdain for those who give of their time by contributing comments …and although you hammered through and eventually had your response looked into I expect the latter is clearly the exception rather than the rule. Source of poor attention-to-detail you experienced during your stay is clearly higher up the chain ! did they offer to make good with a free stay ? I do believe that the GM was unaware of the email I had received, as his response to my email was immediate and very contrite. He also addressed the detail of my complaint comprehensively, so I felt it was sincere and I was satisfied with their response.